May not work on mobile devices. Click on a topic then scroll down to "Documents" for activities, tests and answer sheets, or try a "Game" online. Can you add full stops to the sentences? 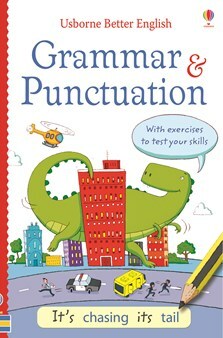 How to use apostrophes for contractions and possession, and for "it's"
Tips and examples about how to use "their", "they're" and "there"
A book of simple, illustrated lessons and exercises to improve children’s grammar and punctuation. Each two-page section tackles a different subject, with explanations of tricky points, a guide to common usage and lots of examples. Includes an exercise on every page so children can test their new skills, with annotated answers to aid understanding. A helpful guide for any child to work through page-by-page, or use as a handy reference book at home or school. Each topic has a two page section - one page explains the principle then has a set of questions; turn the page for the answers and more explanations - this approach really helps children to learn from their mistakes, as they will be able to understand where they went wrong.